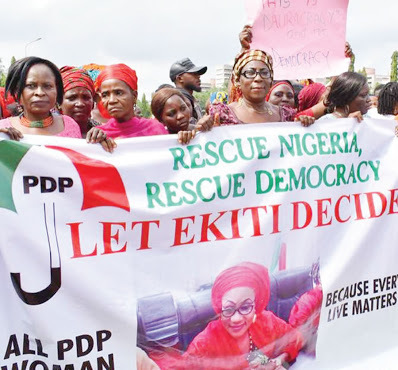 The Peoples Democratic Party (PDP) and the All Progressives Congress (APC) have been throwing jabs at each other over Saturday’s governorship election in Ekiti State. The PDP claimed that the state had been militarised to prepare the ground for rigging of the election for the APC candidate, Kayode Fayemi. The APC said the PDP was making wild allegations because it knew that its candidate will lose. The PDP’s candidate is Prof. Kolapo Olusola. The Nation reports that PDP organised protests in Abuja and some state capitals to express its misgivings over the claim by Governor Ayodele Fayose that the police shot at him and fired into the Government House teargas, which injured him. PDP National Chairman Uche Secondus led a march on the National Assembly. The protesters were received by Deputy Senate President Ike Ekweremadu. Secondus claimed that the Independent National Electoral Commission (INEC), allegedly in collaboration with security agencies, planned to rig the election. He said the state’s residents were living in fear following alleged restriction of movement by security agencies. There was no confirmation of any restriction yesterday. Secondus urged the National Assembly to investigate perceived excesses of security agencies to save democracy. “That is why Ekiti today has been militarised and over policed; 30,000 policemen and women are in Ekiti. “We came first to National Assembly, because you represent democracy and the hope and aspirations of Nigerians. A one-time Minister of Aviation, Mrs Kema Chikwe, said for Nigeria to achieve good governance, there must be true democracy, saying the Wednesday incident in Ekiti was undemocratic. “If you watch the video, you could see shootings in the air and you will see molestation. “PDP ruled for 16 years of peace, and we want it to continue. We are starting now to show that enough is enough; there must be a change so that we will have a credible 2019. That’s what we are starting today”, Chikwe said. Ekweremadu, while receiving the PDP protesters, said: “We will do everything possible to ensure that we will continue to work within the tenets of democracy. “So, whatever we do, we must also know that the world is watching us. We want to thank you for taking this path of honour”. The Senate Caucus of the PDP, led by Senator Godswill Akpabio, called on the Executive to set up a commission of enquiry to investigate Fayose’s claim. But the APC dismissed the PDP’s claims. APC National Publicity Secretary Bolaji Abdullahi said in a statement that with the PDP’s allegations, it was clear that they were not abreast with developments in Ekiti State. The statement said: “We reject the claim by the Peoples Democratic Party (PDP) that policemen were drafted to Ekiti State to harass PDP supporters in Saturday’s governorship election in favour of the All Progressives Congress (APC) governorship candidate, Dr. Kayode Fayemi. “What is clear to every voter in Ekiti is that to vote for this Professor is to hand Fayose a third term. “Given their horrid experience with him, they have wisely rejected them both. “The PDP in Ekiti has read the handwriting on the wall. They know they have lost the election. They therefore have to save their face with these wild allegations. “The story of how Fayose used the security agencies to manipulate the last election is still fresh in the memory of the people. Unfortunately for him, he has no such opportunity this time. Winning a free and fair election is a strange territory to him and that’s why he is looking stranded. NAN reports that security agents also vacated the campaign office of the Peoples Democratic Party (PDP) governorship candidate Deputy Governor Kolapo Olusola. Many supporters of the governor yesterday thronged the Government House, demanding to know if he was hale and hearty. Olusola told the supporters that the governor was fast recovering and that there was nothing to fear.